The Multi-Level Security technology refers to a security scheme that enforces the Bell-La Padula Mandatory Access Model. Under MLS, users and processes are called subjects, and files, devices, and other passive components of the system are called objects. 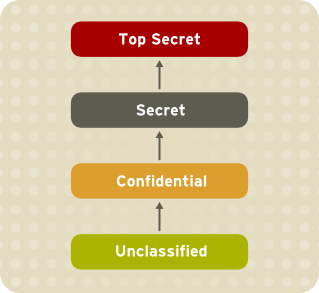 Both subjects and objects are labeled with a security level, which entails a subject's clearance or an object's classification. Each security level is composed of a sensitivity and a category, for example, an internal release schedule is filed under the internal documents category with a confidential sensitivity. Figure 4.1, “Levels of clearance” shows levels of clearance as originally designed by the US defense community. Relating to our internal schedule example above, only users that have gained the confidential clearance are allowed to view documents in the confidential category. However, users who only have the confidential clearance are not allowed to view documents that require higher levels or clearance; they are allowed read access only to documents with lower levels of clearance, and write access to documents with higher levels of clearance. 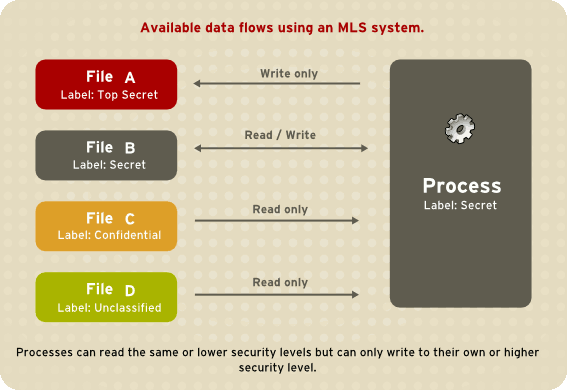 Figure 4.2, “Allowed data flows using MLS” shows all allowed data flows between a subject running under the "Secret" security level and various objects with different security levels. In simple terms, the Bell-LaPadula model enforces two properties: no read up and no write down. MLS access rules are always combined with conventional access permissions (file permissions). For example, if a user with a security level of "Secret" uses Discretionary Access Control (DAC) to block access to a file by other users, this also blocks access by users with a security level of "Top Secret". It is important to remember that SELinux MLS policy rules are checked after DAC rules. A higher security clearance does not automatically give permission to arbitrarily browse a file system. Users with top-level clearances do not automatically acquire administrative rights on multi-level systems. While they may have access to all information on the computer, this is different from having administrative rights. Follow these steps to enable the SELinux MLS policy on your system. *** Warning -- SELinux mls policy relabel is required. Each * (asterisk) character on the bottom line represents 1000 files that have been labeled. In the above example, eleven * characters represent 11000 files which have been labeled. The time it takes to label all files depends upon the number of files on the system, and the speed of the hard disk drives. On modern systems, this process can take as little as 10 minutes. Once the labeling process finishes, the system will automatically reboot. In permissive mode, SELinux policy is not enforced, but denials are still logged for actions that would have been denied if running in enforcing mode. Before changing to enforcing mode, as root, enter the following command to confirm that SELinux did not deny actions during the last boot. If SELinux did not deny actions during the last boot, this command does not return any output. See Chapter 11, Troubleshooting for troubleshooting information if SELinux denied access during boot. The /tmp and /var/tmp/ directories are normally used for temporary storage by all programs, services, and users. Such setup, however, makes these directories vulnerable to race condition attacks, or an information leak based on file names. SELinux offers a solution in the form of polyinstantiated directories. This effectively means that both /tmp and /var/tmp/ are instantiated, making them appear private for each user. When instantiation of directories is enabled, each user's /tmp and /var/tmp/ directory is automatically mounted under /tmp-inst and /var/tmp/tmp-inst.